“What is your favorite subject?” – Art. “What is one thing you know a lot about?” – Art. “What is one thing you are really good at?” – Drawing. 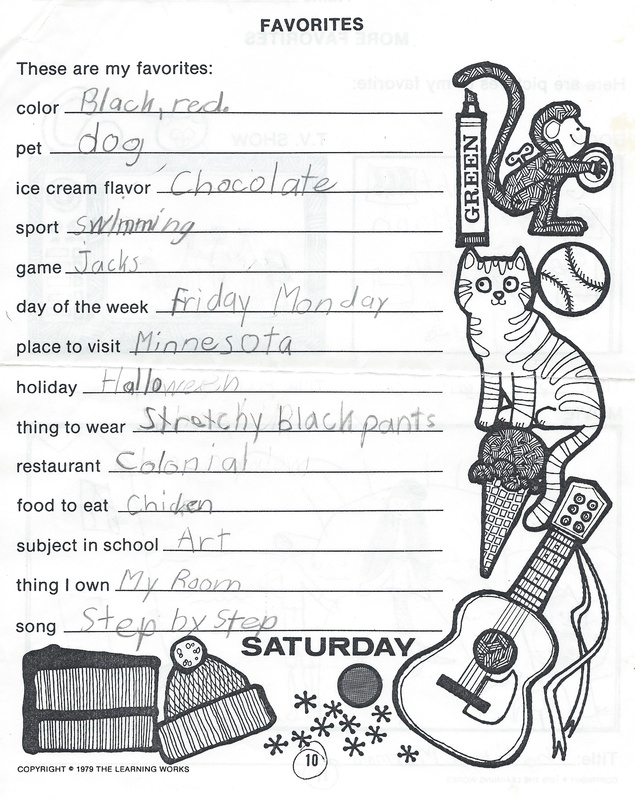 “What is one thing you’d change about school?” – Have art every day. 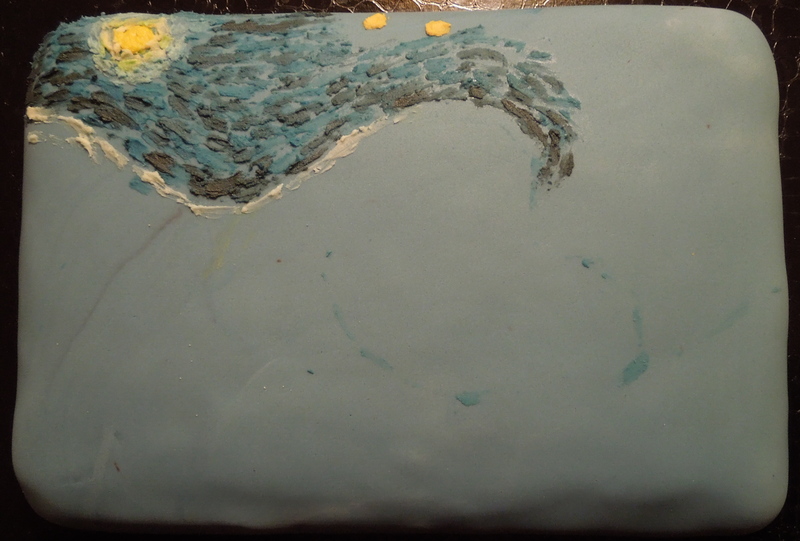 Anyways: crayons, colored pencils, paint, play dough- you name it, I played with it. 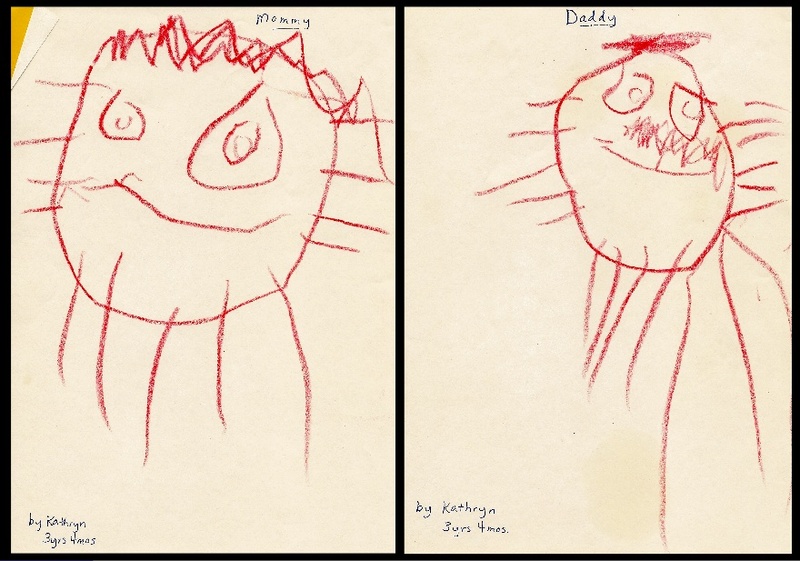 My mom even kept some of my first drawings, as you can see below! Though missing some important features (like bodies), the most notable thing of all was included: my dad’s fantastic mustache. Fast forward a few years: the love of art has remained the same, and the drawing capability has marginally improved (I’ve started to include arms and legs in my figure drawings). 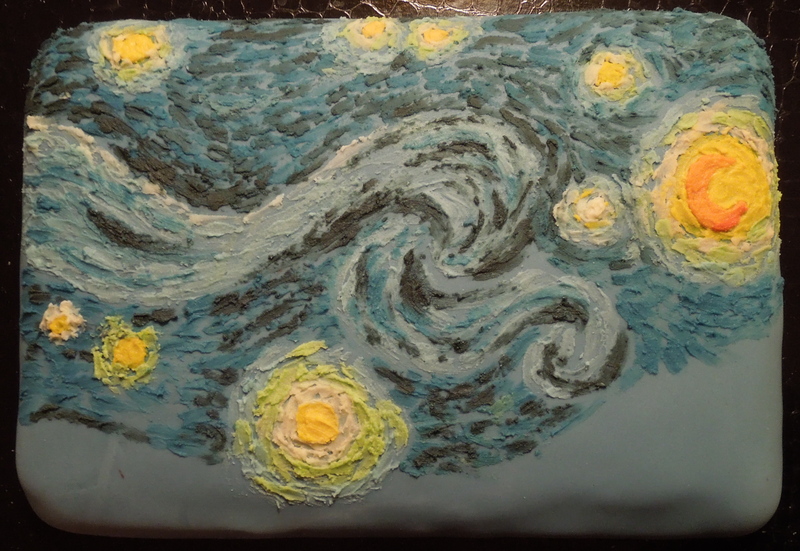 A few weeks ago, I saw a photo of Van Gogh’s famous painting, “The Starry Night.” It occurred to me that this was the perfect opportunity to “paint” a cake using buttercream! 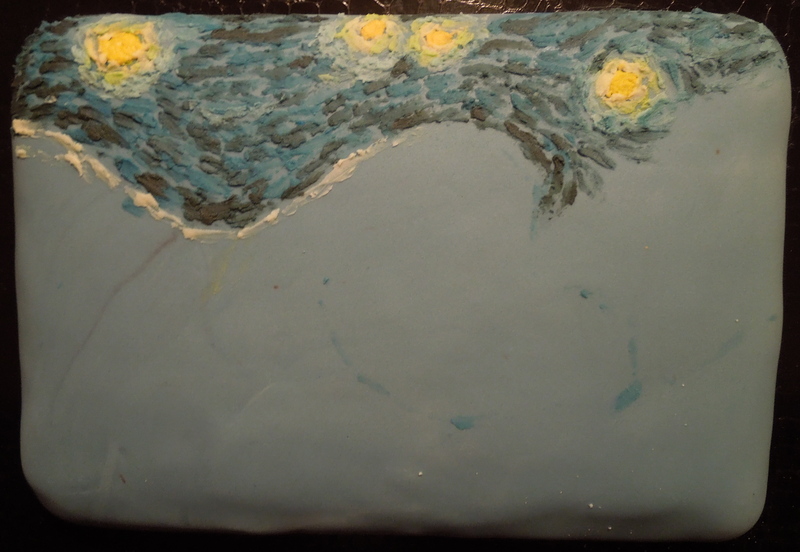 Though making cakes is a huge creative outlet, I’ve been missing real art- drawing, painting, and the like. 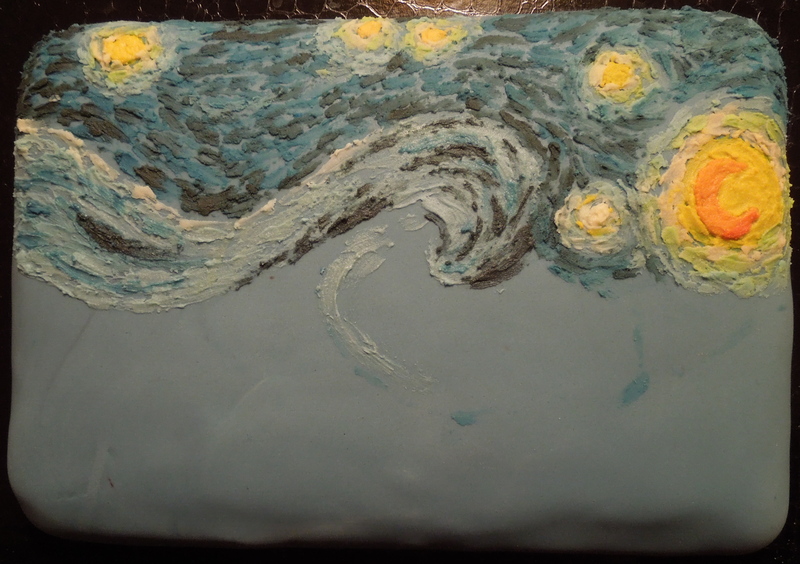 Painting a cake seemed a like a bit of a compromise, and this art style seemed perfect since it uses dabs rather than blended strokes. First thing’s first: the cake! 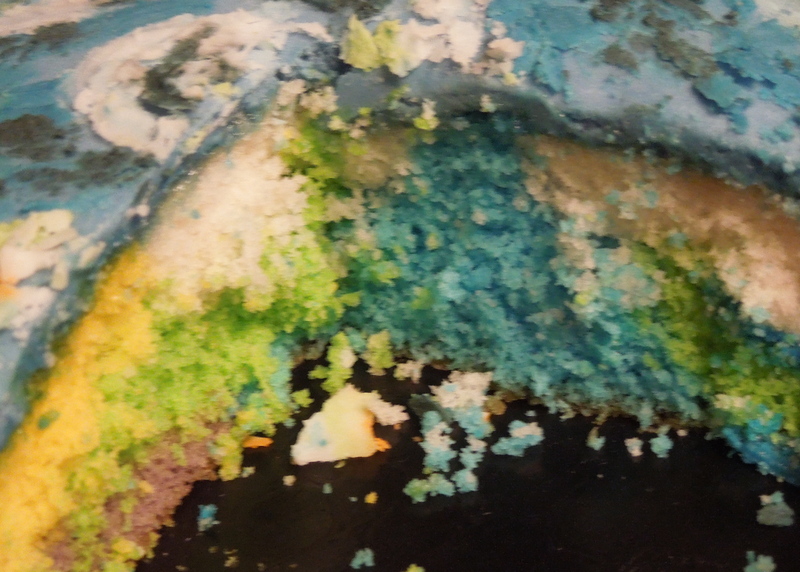 I wanted the “dab” effect to run throughout the cake, rather than just on the surface, so I purchased a Duff tie-dye mix. 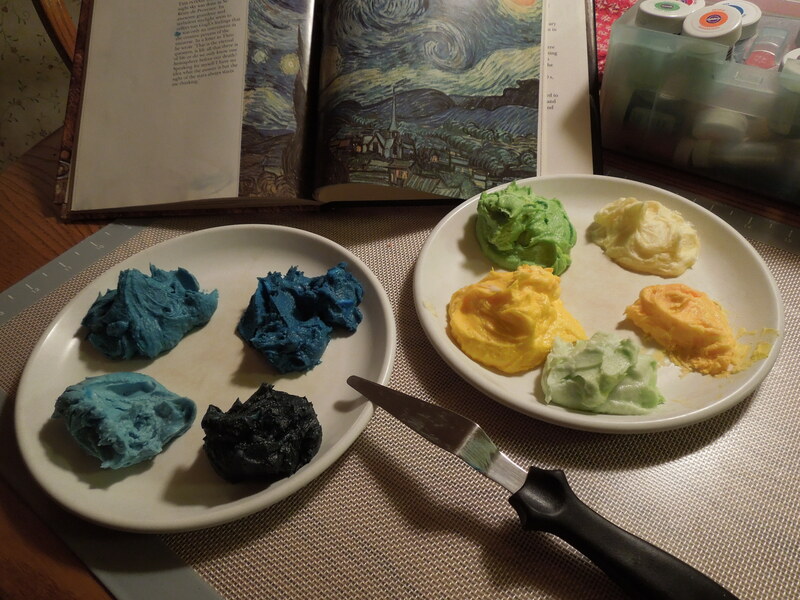 The mix comes with lots of colors, but I didn’t use the reds (since there are no reds or oranges in the Van Gogh). Attention: This next part was great fun! 🙂 I used a spoon and dropped the colors in the pan in a random and assorted manner. 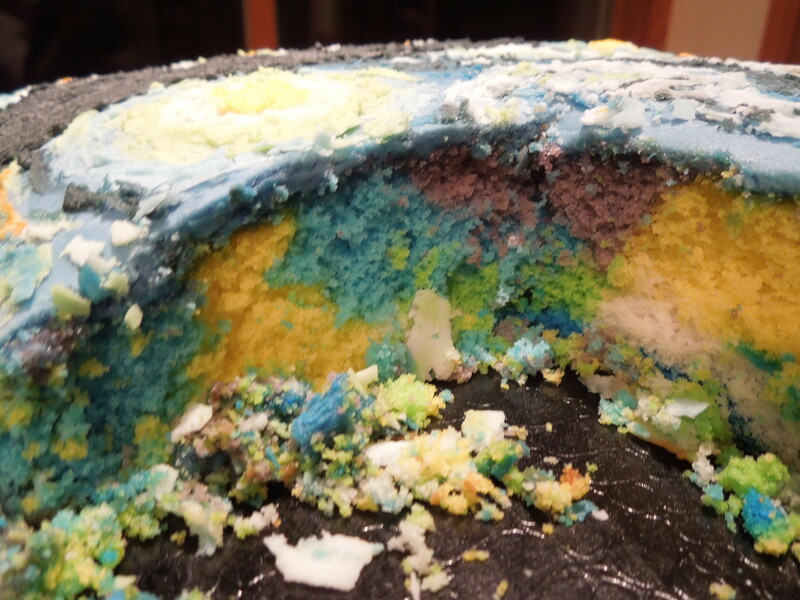 I had to fight an extremely intense urge to run a toothpick through it all and create The Greatest Swirl Ever– but I was afraid the colors might run together. And the cooked result- how cool is that?! 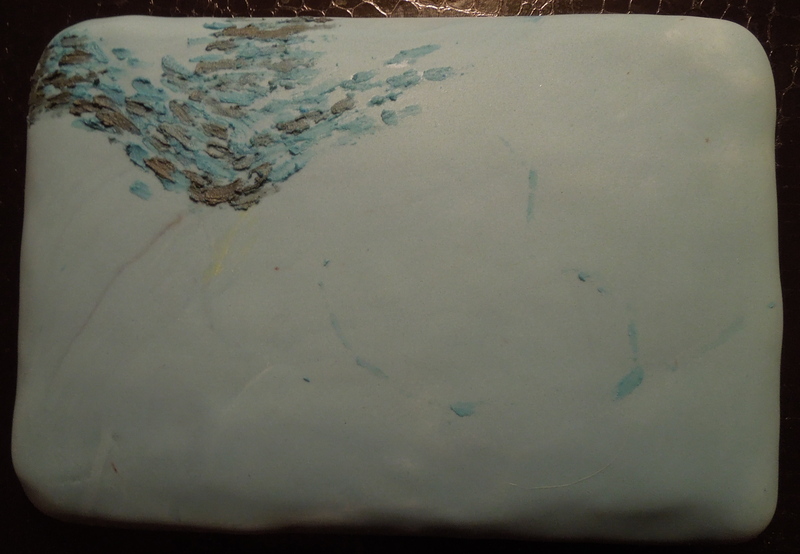 Though unusual to first cover the cake in fondant, and THEN buttercream, I wanted to have a smooth surface to “paint” on. 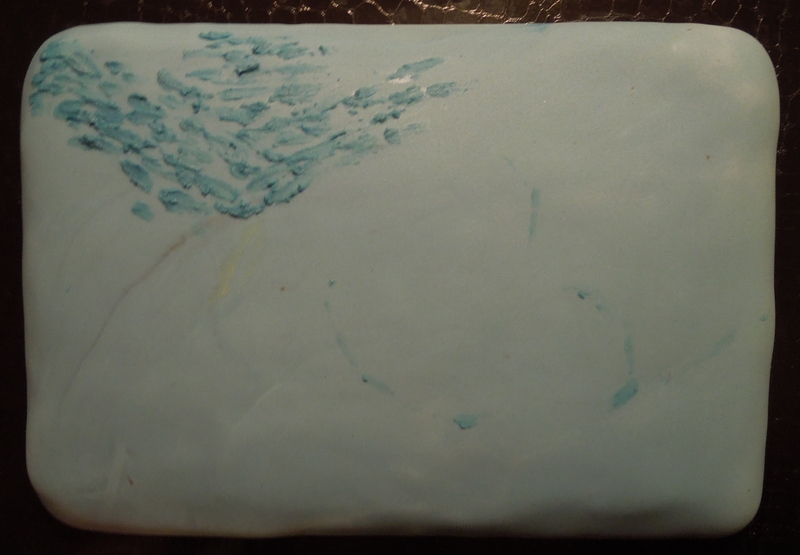 So: on went blue buttercream, and then fondant. 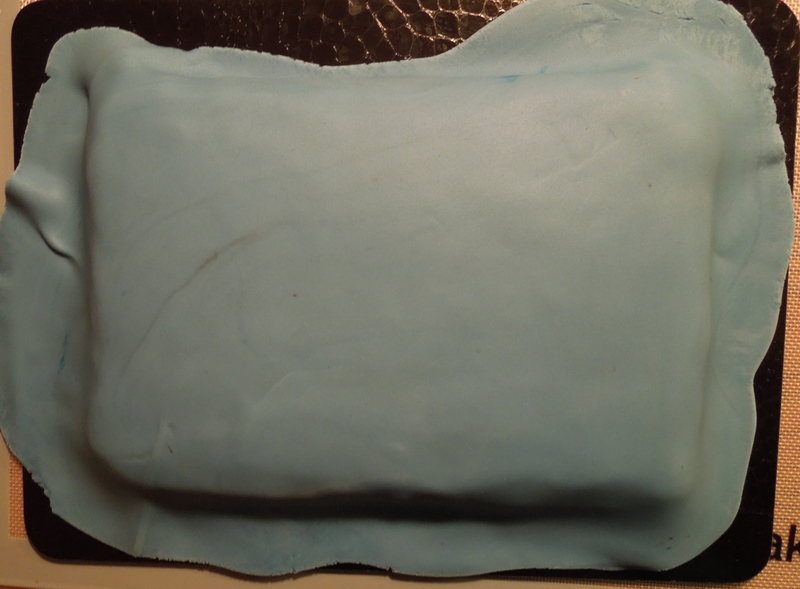 Man, that is a lumpy fondant job- I really stink at covering with fondant. I have watched just about every youtube help video out there, and I still have a hard time. 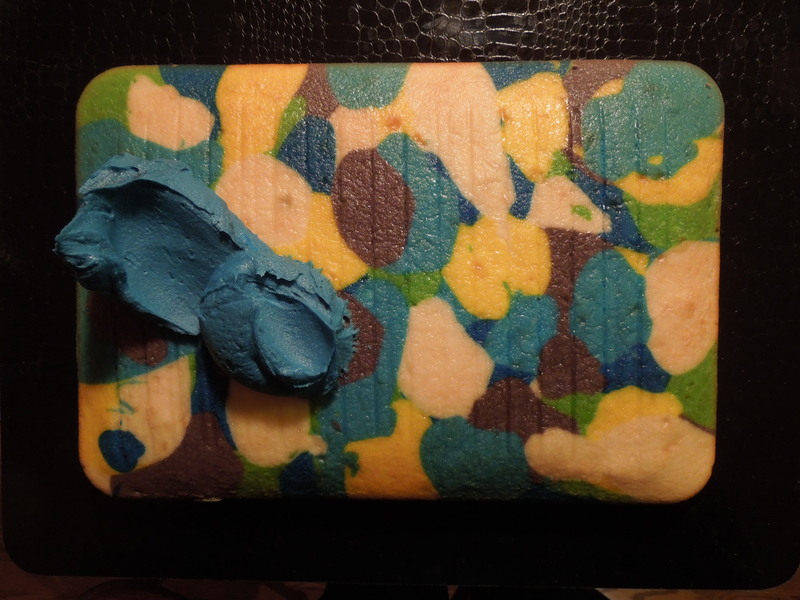 Luckily in this case, the frosting totally covered up the lumpiness- but still. A skill to practice. 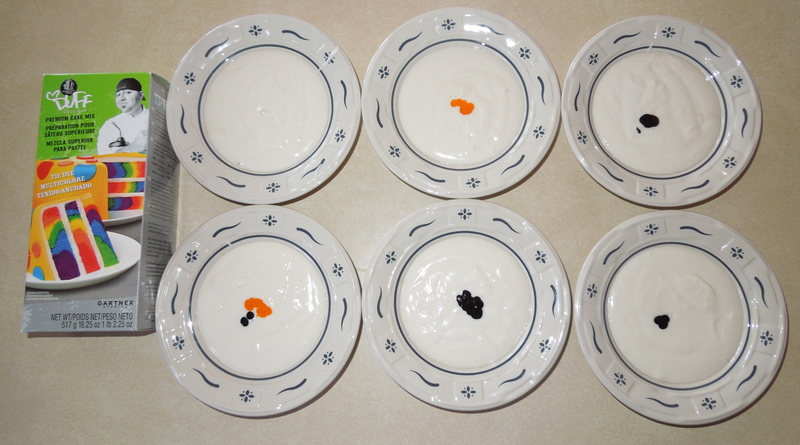 The next step was to create a color palette. 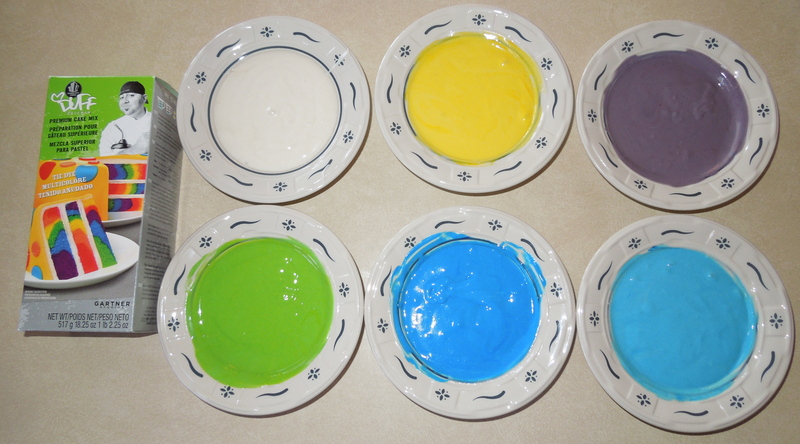 Simply tint the buttercream various colors! As you can see, I very faintly sketched out the major portions of the painting- mainly the large swirl and the beginning of the hill. The final step – just for fun- was to lay a picture frame around the cake and create the illusion that it was hanging on the wall. I laid out a white tablecloth, taped a string to the back of the frame, and stuck a pin in the tablecloth- as if the frame were really hanging on the wall. 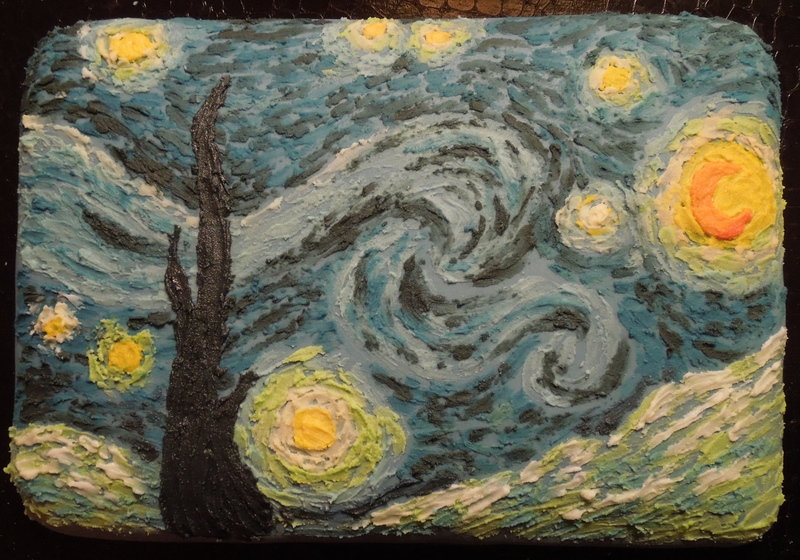 Click here to watch a 3-minute timelapse of a different time I painted this cake! Now for the fun part! As you can imagine, I was DYING to cut into this cake! 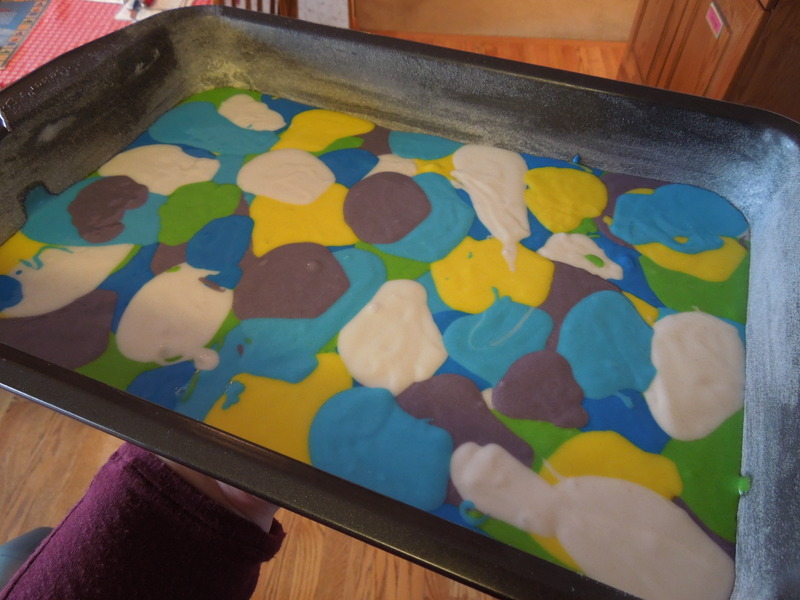 I really wanted to see if the layering would come out- and wow, did it ever! This Duff cake mix is an amazing product. Check out some close-ups below! I had a lot of fun working on this cake. 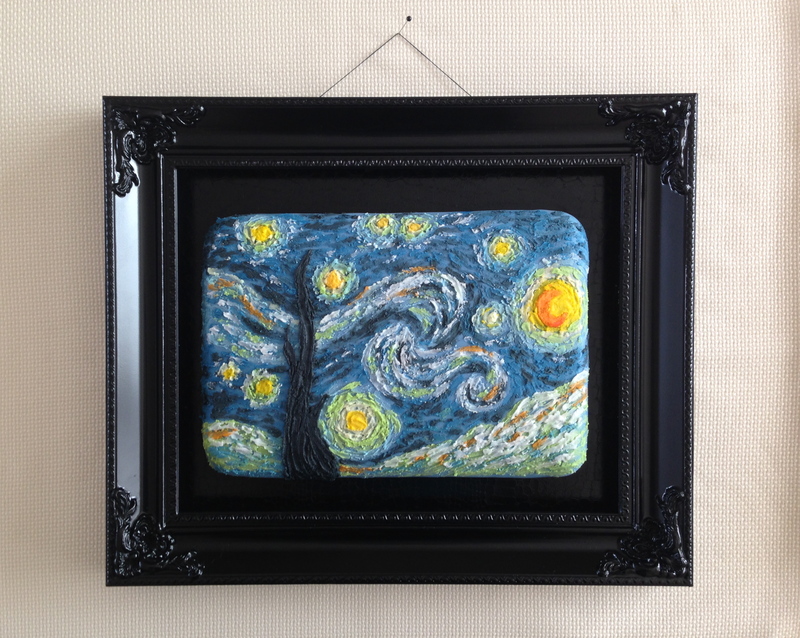 If you could recreate one work of art using a different medium, which would you choose? A Chocolate Rose? Now THAT I Would Accept!